The Greeneville campus of Tusculum College will offer the community its first official arboretum, after recently receiving certification for a Level 1 Arboretum from Tennessee Urban Forestry Council. The announcement was made on Thursday, Oct. 8, at a ceremony in which the college was presented its official Tennessee Urban Forestry Council arboretum designation sign. 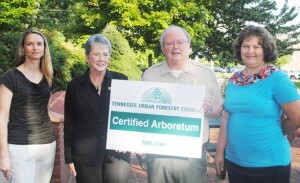 The sign was presented by Tom Simpson, regional urban forester with the Tennessee Urban Forestry Council. According to Kim Carter, science laboratory assistant and instructor at Tusculum, an arboretum is a garden devoted to trees. Arboretums are classified into four levels by the number of different species featured in the arboretum. A Level 1 arboretum, Tusculum College’s arboretum features more than 30 species of trees, most of which are indigenous to the area. Featured will be the historic Tusculum Old Oak tree, which measures 102 feet in height and has a 124-foot average spread. Among the other trees featured are dogwood, pecan, hawthorn, blackgum, maple, beech, sycamore, mulberry and Japanese Zelkova. The arboretum is being coordinated by the college’s science department and will be used primarily by students of the natural sciences, but will be open to the public and area school programs through a self-guided walking tour. “Each tree chosen to be housed in this arboretum has signage indicating the scientific name and the common name,” said Carter, and a campus map has been developed to indicate the location of each featured tree. There are more than 35 existing arboreta in the East Tennessee area, including the Knoxville Botanical Garden and Cherokee Trail in Chattanooga. According to Carter, the college hopes to promote and preserve the natural environment that has existed in the area for hundreds of years. “Visitors for years to come will have a wonderful opportunity to learn about trees, enjoy the beauty and appreciate their many differences,” said Jill Smith, Tennessee Urban Forestry Council arboretum Certification coordinator. Members of the Arboretum Application Committee include Carter, Melissa Keller, chair of the science department and assistant professor of biology, Dr. Michael Bodary, assistant professor of English, former faculty member Aurora Pope, Jeff Hayes, of facilities management, Wayne Thomas, dean of the School of Arts and Sciences, Dr. Ron May, vice president of Academic Affairs and Suzanne Richey, director of College Communications. For more information on the arboretum, contact Carter at kcarter@tusculum.edu. On Thursday it was announced that Tusculum College has been named a Level 1 Arboretum. From left are Dr. Melissa Keller, associate professor of biology, Tusculum President Nancy B. Moody, Tom Simpson, regional urban forester with the Tennessee Urban Forestry Council and Kim Carter, science laboratory assistant and instructor. Tree tours were given on the Tusculum College campus on Thursday of the more than 30 trees designated as part of the arboretum. 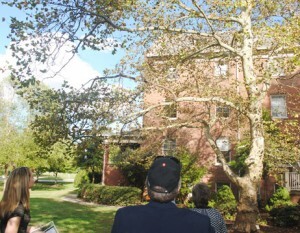 Tour participants inspect a sycamore tree near Virginia Hall.